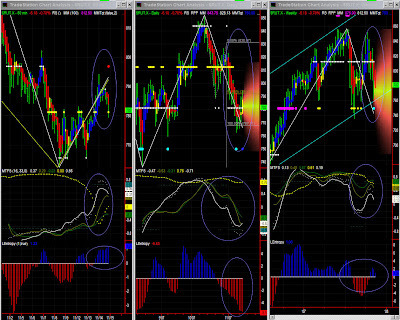 Dominant TF: Daily, and short intraday time frames. MTFS and Entropy both indicate a congestion with a slight upward bias, but the significance level is very low, so onw should rather look at shorter intraday time frames for trading points or follow the daily chart for direction. 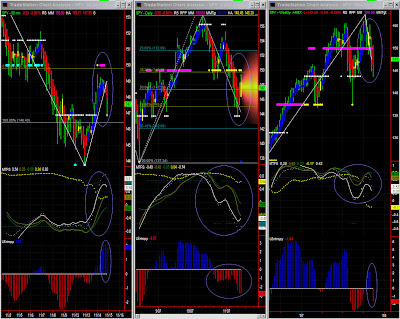 MTFS is bearish until lines meet, and Entropy is very bearish although at -5.5 it is likely to bottom out soon. A Fib pattern may have completed at 767, and may be tested again (or close) to complete the pattern fully. There is no indication yet that it will go much lower for now. No chance of a recovery though. At first sight it looks like we had the anticipated double top. However, one should not jump to conclusions just yet, as we may have a broad [750-875] trading range. The 750 level has indeed turned from pivot to strong support level. In addition, we have a PR2 Fib level around 740 and RUT has in the last 2 years always bounced back on PR2, so there is no reason it will behave differently this time. 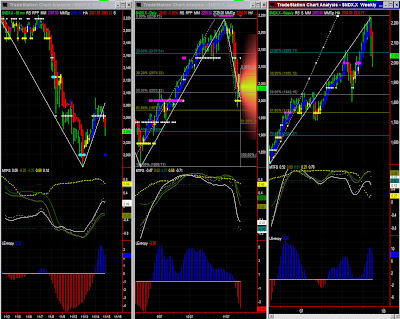 Market direction: congestion to down. Entropy and MTFS point toward a minor fall or just a congestion within the current trading range. However 150 is now the upper resistance level, so one cannot discard testing lows again. MTFS and Entropy do not look good and at this stage it is likely that the fall will continue until MTFS lines meet. We have to see whether the last bounce on PR2 around 145 will hold again. Weekly: congestion to mildly down - very low significance level. The down draft is not over yet, but Entropy and MTFS do not point toward a fall but rather to a test of 2000 again. Significance level at 0.69 is alright, but one should certainly take cues from shorter time frames for trading points. We knew we had to watch for that growing divergence, and Entropy peaking. Now, there is still no overall change in direction and this profit taking is only healthy after such a bull run. We have recurrence of the 1935 level, so it could certainly retrace a little more. Speed is however difficult to anticipate in this high vol environment.